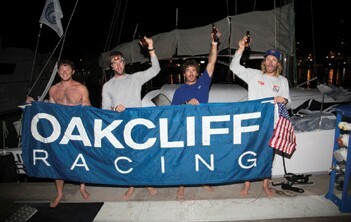 On December 12, Oakcliff Ocean Racing Team finished first in class and second overall in the RORC Transatlantic Race. Dan Flannigan, 23, Hobie Ponting, 23, Chris Kennedy, 26 and Andrew “OD” O’Donnell, 27, completed the 3,100 nautical mile race from Lanzarote, Gran Canaria to Grenada aboard Oakcliff’s new Class40 with an elapsed time of 12 days, 13 hours, 15 minutes and 41 seconds. Only two months ago, Oakcliff Sailing in Oyster Bay, NY received a call that the Bodacious Racing Team in Chicago, IL wanted to donate their Class40 to Oakcliff. The detail that the boat was in Hamble, England was quickly remedied when the core of the Oakcliff Ocean Racing Team created and executed a plan that had them flying to the UK with coach Jeffrey MacFarlane, a top shorthanded sailor and an Oakcliff graduate. After taking delivery, the team sailed to the Canary Islands for the start of the race. “This is just one of the exciting and life-changing opportunities that Oakcliff is providing to young hungry athletes who come to Oyster Bay to test themselves in the extreme world of ocean racing, the uber-competitive match racing world or to aim for the Olympics” said Oakcliff Executive Director Dawn Riley. Applications for Oakcliff’s 2015 training programs can be found at oakcliffsailing.org.